In the introduction to The Encyclopedia of Punk , author Brian Cogan explains the purpose of the book. Since punk is a complex, ever-changing subculture, Cogan eschews definitiveness for "a general reference for, and guide to, the vast expanse of work that has been labeled punk rock over the past few decades" (viii). Not only that, but the book must convey "a sense of the urgency and importance of punk rock" (x) to the reader. A daunting task, but Dr. Cogan, an English professor at Molloy College, is largely up to it. I don't believe that Sid killed Nancy...Sid loved Nancy. On the Pistols' American tour, he wanted to talk to me about her all the time, because I had known Nancy before he did. Sid would ask me questions about her like, "Was she really a prostitute?" An encyclopedia should be more objective than an uncensored oral history, but, as the old saying goes, the truth sometimes gets in the way of a good story. The Encyclopedia of Punk is about 1/3 graphics; entire pages are filled with photos of live shows, album covers and press photos. Narrow strips of text frame large images; this distracts the reader and makes the text seem almost superfluous. Since the book is 11x11" across, and weighs north of three pounds, I have to wonder if fewer, or smaller, images would have sufficed, making the book allowing more room for text. Fashion-minded people should find much interesting in these images, however, which are large and (generally) high resolution. An ambitious fashion student could use this book as a launching pad to study the evolution of trends through the history of punk. Why, for example, was Dee Dee Ramone photographed wearing a "Pep Boys" t-shirt? When and where did facial piercings become common in the punk scene? These questions are beyond the scope of this book review, though they are addressed in a brief essay (360-1). If you're writing a thesis on punk, or if you're just looking for a comprehensive guide to the different strains of the movement, the Encyclopedia of Punk is a good place to start. Due to the nature of the beast, this is a reference book, and those looking for more specialized knowledge should go elsewhere. 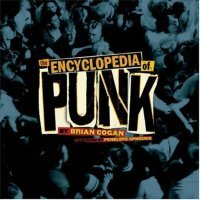 The Encyclopedia of Punk at Amazon.com . Return to our books on style section.